Piezoelectric Materials, Ultrasound Transducers and Arrays Characterisation by Laser Interferometry. A laser interferometer was used to study piezoelectric materials including piezoceramics, piezocomposites and ultrasound transducers (single element and array) for non destructive testing and medical ultrasonography. Experiments are carried out in air with a continuous wave method for materials characterisation, and in water with a transient method for ultrasound transducer performances quantification. 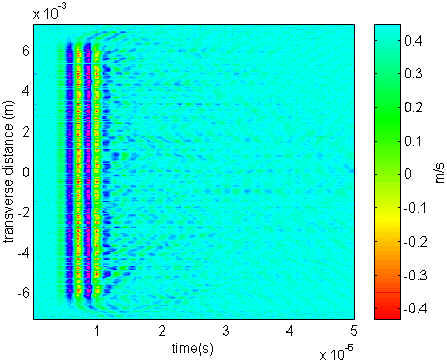 The results demonstrate that laser interferometry is an alternative and complementary technique to ultrasound transducer engineering commonly used methods (impedancemetry and hydrophone measurements). The characterisation of piezoelectric materials and ultrasound transducers including arrays is a key issue for ultrasound transducer designers and users. Standard methods such as electrical impedance measurements, d33 meters or hydrophone measurements are sometimes limited. 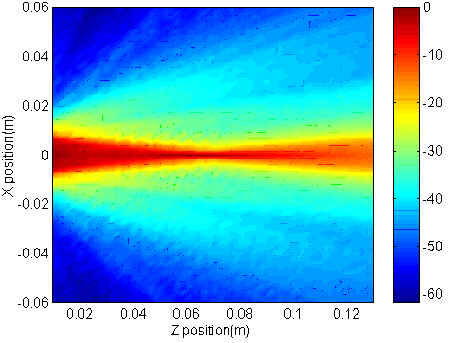 In this study we show several examples of the use of a laser interferometer, as a tool to characterise and evaluate active materials at different levels of complexity, piezoceramic disc, a piezocomposite plate, a single element ultrasound transducer, an ultrasound array element and a fully connected array. For the experiments, a compact Mach Zehnder heterodyne interferometer SH-140 probe  commercially available probe from B. M. Industries[http://www.tctus.com/bmipages/index.htm] , France, equipped with a 100 mW diode pumped and frequency doubled YAG laser, is used. The laser spot can be decreased to 30µm diameter using an optical lens. The minimum displacement amplitude that may be detected is fixed by the electronic noise of the photodetector which is 10-5 with a mirror-like surface, and 3.10-4 on a black-like surface. The system has an absolute bandwidth up to 40 MHz, but in order to improve sensitivity and signal to noise ratio, a low pass filter at 20kHz and a high pass filter at 18 MHz are used for most experiments. This gives a minimum of detectable displacement of 2.3 nm on a mirror like reflective surface (the conversion ratio is 10mV/Å). In order to obtain such a mirror like front surface, samples under test have to be prepared: for bulk materials like piezoceramic and piezocomposite, the surface electrodes are usually polished with fine grade diamond powder, and for transducers or arrays it is possible to coat the front face with evaporated gold , or to bond a thin metallised polyimide sheet (<5µm). Two types of measurements can be performed : transient displacement response and continuous wave (CW) displacement response. For the transient measurement, the device under test is excited with a pulse wave generator and the displacement is obtained by taking the time response from the laser electronics with an oscilloscope. The CW response of the displacement (frequency domain), is obtained using a network analyser. The source voltage is collected at terminals of the excited element and used as the Reference signal of the network analyser. The displacement signal delivered by the interferometer is used as the Transmitted signal of the network analyser. The analyser automatically provides the vobulation of the voltage source and gives the phase difference and the relative gain (in Angström per volt) between the source signal and the displacement. Thus we obtain, for each point of measurement , the frequency response of mechanical displacement (modulus-phase or real-imaginary components). Measurements can be performed both in water or in air. In the case of water, the sample under test is immersed in a water tank, and handled in a Gimbal Jig (to allow the orientation with respect to the laser beam). It is positioned in the water tank with a micrometric automated system (from TRIOPTICS[http://trioptics.fr/], France) drove by a PC via GPIB link. The laser beam enters the water tank through an optical window specially coated for the YAG wavelength to avoid reflection. In air, the sample is handled and directly placed in front of the laser probe using the same automated positioning system. Figure 1 shows the configuration of the experimental setup. Fig 1: Picture of the experimental setup. The standard method to characterise piezoelectric materials (plate, disc, rod...) is the measurement of their electrical impedance as a function of frequency with an impedance analyser. It is then possible to recover constants of the material by fitting the experimental curves with an analytical model of the electrical impedance of the considered vibration modes (radial, thickness extensional, length thickness extensional...) such as a modified KLM equivalent circuit with dielectric and mechanical losses taken into account (i.e. complex coefficients) . The measured electrical impedance of a PZ 27 piezoceramic disc (from Ferroperm[http://www.ferroperm.com/], Denmark) with a thickness of 500µm and a 12 mm diameter was fitted with a thickness mode model, in order to recover fundamental parameters (coupling coefficient, dielectric permittivity, losses...). The surface displacement at the centre of the disc was measured with the laser interferometer using the CW method and the KLM model was programmed in order to simulate the surface displacement per volt. Simulated and measured results are presented in figures 2 and 3 respectively for the fundamental and the third harmonic. On figure 2, two peaks can be observed, the lowest in frequency being the thickness mode whereas the second is a high frequency radial overtone coupled with the thickness mode. On figure 3, the third overtone resonance of the thickness extensional mode is clearly distinguished. A good agreement between theoretical and experimental curves is shown. These results demonstrate that measurements from a laser interferometer allows the validation of electromechanical simulation models and that an electrical impedance fit allows the electromechanical performances of piezoelectric materials to be correctly predicted. Fig 2: Experimental (thin full curve) and theoretical (thick full curve) displacements (logarithmic scale) of a Pz27 disk as a function of frequency for the fundamental resonance. Fig 3: Experimental (thin full curve) and theoretical (thick full curve) displacements (logarithmic scale) of a Pz27 disk as a function of frequency for the third overtone. 1-3 piezocomposite materials (combination of a piezoelectric ceramic and a non-piezoelectric polymer with a 1-3 connectivity) have become, during the past 20 years, popular materials for ultrasound transducers and arrays. Here, a piezocomposite plate with a thickness of 3600 µm, a pitch of 1250 µm and a kerf of 650µm, corresponding to an operating frequency around 450 kHz, was scanned with the laser interferometer, using the CW method from 200kHz to 2.5MHz with a 570 kHz resolution. The scan was performed on a 5mm*5mm area with a spatial sampling of 50µm. Figure 4 shows the experimental homogenised surface displacement (sum of all surface displacements) and the simulated displacement obtained with the KLM model using homogenised parameters (resulting from the fit of experimental data with the model). Fig 4: Experimental homogenised surface displacement (green line) and simulated surface displacement (red line) as a function of frequency for the piezocomposite plate. Five peaks appear on the measured spectrum, three of them can be identified as the thickness mode and its third and fifth overtones. The other remaining resonances cannot be explained by the model which considers the material as homogenous, and vibrating on the thickness extensional mode. They result from the lateral modes linked to the periodic structure of the piezocomposite material. Perturbations from these parasitic modes could be taken into account with multidimensional models such as finite elements. Fig 5: Displacement pattern of the composite plate surface for the fundamental thickness resonance : (425 kHz). Fig 7: Displacement pattern of the composite plate for the third overtone of the thickness resonance perturbed by the high frequency lateral modes (1.42 MHz). The higher frequency vibration modes (figures 6 and 7) can be observed by setting the frequency to that of the peaks observed in figure 4. The first lateral mode of the structure is observed at 866kHz (figure 6). It can be noted that the piezoceramic rods are all vibrating in phase, and that the polymer vibrates with an opposite phase. The inhomogeneity in the displacements and the proximity of this parasitic mode to the thickness mode could be a disadvantage while using this plate to manufacture large bandwidth transducer (i.e the thickness mode could couple with the lateral mode). At 1.42 MHz (figure 7), the third overtone of the thickness mode , is perturbed by high frequency lateral mode of the piezocomposite structure, as expected by observing figure 4. These results demonstrate that, with a laser interferometric measurement, it is possible to clearly identify all the vibration modes of a 1-3 piezocomposite structure and their displacement pattern. Then, homogenised parameters of the material for the thickness mode could be obtained by fitting the experimental displacement data with a KLM model. Fig 8: Surface particle velocity as a function of time and position on the transducer surface along a diameter. In this section a flat single element transducer commonly used to perform material characterisation (velocity, attenuation measurements...) is studied. This transducer has a 13mm diameter and a centre frequency of 3.5 MHz. An electrical excitation of 90 Volts with a duration of one period at 3.5 MHz is applied to the transducer. Surface displacement is obtained by scanning the transducer surface with a spatial sampling of l / 10. The normal particle velocity is obtained by a numerical derivation of the displacement (figure 8). The displacements are filtered in the spatial domain in order to smooth the heterogeneity of optical reflectivity of the transducer surface. Figure 9.a shows the surface particle velocity at a fixed point (i.e. centre of the transducer), as a function of time. Figure 9.b shows the particle velocity at the time defined as the first positive maximum of velocity, along the diameter of the transducer, with and without spatial filtering of the data. One can observed that the vibration at the surface of the transducer is well described by a piston-like motion during the first 2 µs (the large amount of noise may be due to the variation of optical reflectivity across the surface and the noise brought by the numerical derivation). In addition to the classical fundamental thickness mode, reflection on the metallic edge of the transducer and surface waves travelling along the face of the circular transducer can be observed. This type of measurement is very useful for controlling transducers performances and defects. These curves can be used as inputs to simulation models of radiation patterns and acoustics fields (linear or non-linear), which can be directly compared to experimental data obtained by hydrophone measurements . Fig 9: Surface particle velocity as a function of time at the centre of the transducer (a), profile of the particle velocity at the first maximum as a function of position on the transducer surface (b) along a diameter. Ultrasound arrays are commonly used for non destructive testing and biomedical imaging. Evaluation of their performances are necessary in order to reach optimum configurations. Unfortunately, cross-coupling in ultrasound arrays has a deep impact on their performances [5,6] : it decreases the sensitivity and the angular directivity and increases the acoustic noise level. It is very important to have a precise and accurate measurement of this phenomenon, in order to evaluate its impact on the quality on both B-scan and C-scan images. Fig 10: Displacement as a function of time and position on the array surface. First, a part of conventional 1D 3.5MHz linear array, composed of 16 elements with a pitch of 500µm, is studied. The structure consists of 1-3 piezocomposite mounted on a backing and covered by a single acoustic matching layer. 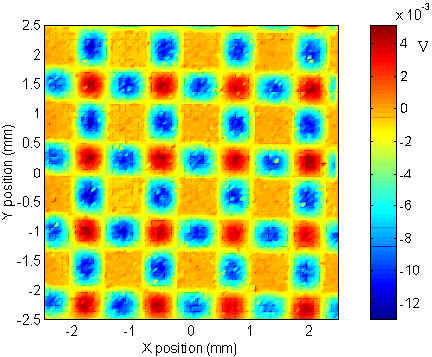 The spatial scan is performed along the array surface [-4000µm,4000µm] from the element centre with a pitch of 50µm, which represents a spatial sampling of l / 9 (l being the wavelength in water at the array centre frequency). In figure 10, surface displacement as a function of time and position on the array surface is represented (red-blue colours positive displacements, green colour negative displacements). One can observe, immediately after the excitation, the scan centre, the excited element working on its thickness mode. Afterwards, plate modes at the array surface clearly appear, through the two oblique traces on figure 10. A first quantitative result is that the spatial effective aperture of the excited element measured at the instant where the maximum of surface displacement is reached, is approximately 600µm whereas the pitch of the array is 500µm. This increase of the elementary width is a consequence of the internal electrical coupling in the piezocomposite material and of shear mechanical coupling mainly within the matching layer. This type of analysis and measurement can also be extended to 2D array elements . where r is the density of the medium and f( ,t) is the velocity potential. where v(t) is the instantaneous normal particle velocity, is the vector from the point source on the radiating surface to the observation point defined by , and q is the angle between and the surface normal vector. The basic hypothesis are that the waves are propagating in a linear, homogeneous and non attenuating medium. Simulations are performed in the farfield of the array. Figure 11 shows the simulated radiation pattern of the element using the measured displacement data, compared to hydrophone measurement and to the simulated radiation pattern of a piston-like rectangular shaped element with a width equal to that previously measured. It can be observed that the simulation from laser data is close to hydrophone measurements and that the acoustic behaviour of the array element is close to that of a piston-like element. The acoustic pressure difference for wide angles between the simulated results and the hydrophone measurements is due to fact that no diffraction correction for the hydrophone was applied. Moreover, plate modes at the array surface do not interfere with the radiation pattern of the element since no parasitic lobes are observed on the elementary radiation pattern In fact they just decrease the elementary sensitivity. 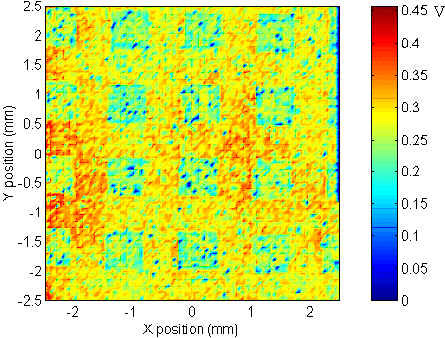 These results show that with laser measurements it is possible to predict the pressure field generated by an array element everywhere in the half space of propagation, and that it is possible to quantify all the fundamental parameters of the element : directivity, acoustic noise level, resolution and bandwidth. 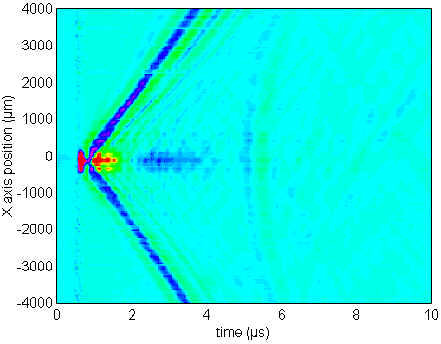 Fig 11: Transverse radiation pattern of the array element : hydrophone measurement (blue line), simulated from laser interferometry measurements (red line), simulated with a piston like hypothesis (green line). A second linear array, operating at 4 MHz (backing, 2matching layers and piezocomposite) with a 500 µm pitch is studied. A fully programmable 64 channel emitting electronics (Ultrasons Technologies, France), with a range of delays from 10ns to 128µs and a bandwidth from 50kHz to 50 MHz was used to excite 32 elements of the array. Delays are set in order to focus the acoustic beam at a depth of 70mm and no deflexion is applied. 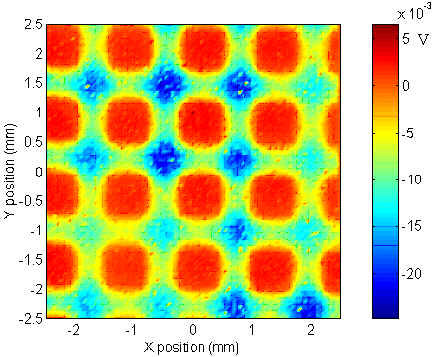 A spatial scan over the array surface is performed with a resolution of 20µm (figure 12). Fig 12: Displacement as a function of time and position on the array surface, delays set to focus at 70mm depth (in red the positive displacement and in blue the negative one). 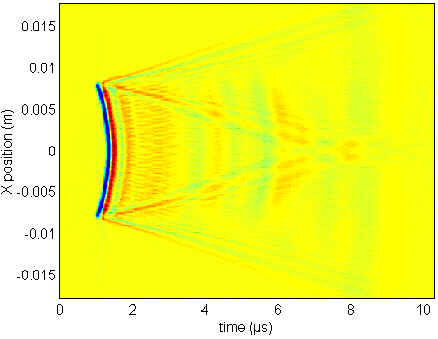 Fig 13: Pressure field of the 32 element array simulated using surface displacement laser measurements as a function of position propagation half-space. One can observe that all the elements are active, and that the displacements are homogenous along the array. By measuring the curvature of the first wave front it is possible to verify that electronic delays are well applied and that they correspond to a focal depth of 70mm. Using the previously described radiation pattern simulation tool, it is possible to calculate the radiation pattern of this focusing aperture in water (figure 13). In the figure 13, one can observe that the focal point is on axis, at a depth slightly lower than 70mm. From this pressure field, it is possible to evaluate the acoustic performances parameters of the array , resolution (axial and lateral), bandwidth, acoustic noise level and focal width, without any hydrophone measurements which are very time consuming. Here, for example, the average acoustic noise level is lower than -35 dB (in transmission), which is a suitable value for ultrasonic imaging. This work shows that laser interferometry is a particular attractive characterisation technique for piezoelectric materials including piezoceramics and piezocomposites as well as ultrasound transducers for non destructive testing and medical ultrasonography. The authors thank L. Ratsimandresy and R. Dufait of Vermon S.A.[http://www.vermon.com/] (Tours-France) for providing the arrays and the piezocomposite plates, and J.P. Remenieras, F. Levassort and L.P Tran of GIP Ultrasons / L.U.S.S.I[http://www.univ-tours.fr/recherche/lab06.htm] for their effective collaboration to this work. D. Royer, E. Dieulesaint, and Y. Martin, "Improved version of a polarized beam heterodyne interferometer," Proceedings of the IEEE International Ultrasonics, pp. 432-435, 1985. L. P. Tran-Huu-Hue, F. Levassort, N. Felix, D. Damjanovic, W. Wolny, and M. Lethiecq, "Comparison of several methods to characterize the high frequency behaviour of piezoelectric ceramics for transducer applications", Ultrasonics, vol. 28, pp. 219-223, 2000. J. P. Remenieras, O. Boumatar, N. Felix, V. Labat, and F. Patat, "Time-domain non-linear distortion of pulsed finite-amplitude sound beam : Calculation and experimental", Proceedings of the IEEE International Ultrasonics, vol. 2, pp. 1291-1294, 1999. D. Certon, N. Felix, L. P. Tran-Huu-Hue, F. Patat, and M. Lethiecq, "Evaluation of laser probe performances for measuring cross-coupling in 1-3 piezocomposite arrays", Proceedings of the IEEE International Ultrasonics, vol. 2, pp. 1091-1094, 1999. N. Felix, D. Certon, E. Lacaze, M. Lethiecq, and F. Patat, "Experimental Investigation of Cross-Coupling and its Influence on the Elementary Radiation Pattern in 1D Ultrasound Arrays", Proceedings of the IEEE International Ultrasonics, vol. 2, pp. 1053-1056, 1999. N. Felix, M. Lethiecq, C. Millar, et L. P. Tran-Huu-Hue, "Influence of piezoceramic composition, pitch and layout on the performances of sparse arrays transducers for medical imaging", SPIE's International Symposium on Medical Imaging : Ultrasonic Imaging and Signal Processing, vol. 3982, pp. 225-233, 2000. N. Felix, D. Certon, L. Ratsimandresy, M. Lethiecq, and F. Patat, "1D ultrasound array for medical imaging, performances evaluation and characterization by laser interferometry", to be presented at the 2000 IEEE International Ultrasonics syposium, Puerto Rico.